The 2017 World Triathlon Series is well underway, with two competitions down in the nine-stop tour across the globe. While this new season has shined a light on many athletes choosing different competition paths or personal events post the Rio Olympic buzz, one woman from Great Britain has instead been show-stopping the female field to stake claims on a WTS World Title. Last year did not go as planned for Jodie Stimpson. After a disappointing 2016 left her unable to fulfill her Olympic dream for Rio, she missed the final spot on the women’s team. 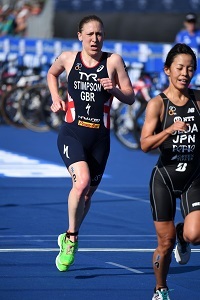 But despite the letdown, Stimpson walked away from the year with a strong top-seven finish in the overall Series rankings and ended up with two podiums including one WTS win. So, while the year was a personally difficult one for the Brit, the things that she learned and grew from the experience enabled her to want to start this year fresh, as one of the top elite women. Entering the new season, 2017 was shaping up to be revealed as a whole different type of competition, as many top contenders, such as Gwen Jorgensen (USA), Helen Jenkins (GBR) and Nicola Spirig (SUI) announced that they would not be competing because they were pregnant. Therefore opening up the field for possible newcomers or old rivals to come in and take over the leaderboard. As the 2017 World Triathlon Series kicked off in the Middle East, the whole world watched to how Stimpson was going to perform, eager to see her take the same stage that earned her the opening gold medal the year before in 2016. She ended up in the middle of the field in the swim, which caused her to just miss getting into the lead bike pack after the first transition. However, Stimpson clearly showed that she had been working on her cycle during her winter training as it only took her a couple of laps to draw her group to be mixed among the leaders. Not stopping there, she then pushed ahead to become the driving force of the leading women and cycled through with a strong and fierce bike performance, setting herself up for an even stronger run. It was Stimpson’s force on the bike that propelled her to be one of the top runners that day and peel off those behind her one by one. However, despite it looking like Stimpson was going to take the gold, New Zealand’s Andrea Hewitt put forth a steaming sprint finish on the blue carpet and bypassed Stimpson. So while Stimpson was unable to reclaim her Abu Dhabi title, she ended up with a silver medal and climbed proudly back onto the WTS podium for the first time since Cape Town last year. As the WTS continued in the Gold Coast, Australia, once again the eyes of the world were on Stimpson, as the reigning 2014 Commonwealth Games Champion, she would be getting the chance to compete at the same venue that will host the 2018 Gold Coast Commonwealth Games, where she will attempt at reclaiming her crown. Women’s triathlon will award the first gold medal of the Games next year and Stimpson will want it around her neck. However, after the first sprint race of the year, the result was not what the Brit had hoped for, taking 16th overall after the day. But because of her second-place finish in Abu Dhabi, Stimpson today still stands at fourth overall in the Series rankings, leaving the path to the World Title still very much in the realms of possibility. With seven races still to go this season, Stimpson is reaching for the World Championship, aiming at a feat she has not yet fulfilled in her career. But for anyone who has ever watched the Brit on the triathlon course knows, it is only a matter of time before she gets on that overall Series podium. And could 2017 be the year to do it? Only time and race finishes will tell. But one thing is for sure, Stimpson is a new racer this year and the triathlon world can be nothing but excited to see what she does for the rest of the Series. So what can we expect in her next competition? Enjoyment - the key word for Stimpson this season. Enjoying the sport she loves and enjoying the competitions no matter the outcomes. So as the Brit continues her attempt at her first World Title, the world will join in on her enjoyment of watching her race, hoping nothing but the best on her road to redemption.